We recently received the brand-new Corsair Obsidian Series 1000D super-tower case, so watch above as Steve installs the foundations for a mega build he's calling CoffeeRipper. The Obsidian 1000D is bloody big. Did we mention this super-tower can fit two desktop systems? I suppose given the size that’s hardly surprising. 'CoffeeRipper' will be a special build housing both an 8700K gaming rig along with a 1950X workstation, now that’s the stuff of dreams. Some of you might have caught wind of this super-tower a few months ago when Corsair and Amazon accidently leaked information about the upcoming case. I’m actually surprised this didn’t happen sooner as I agreed to the 1000D embargo with Corsair back in December, but due to various issues the release has been pushed back until now. I assume there was some kind of production issue with the front glass panel which showed curved edges in the leaked photos. This has now been replaced with a flat glass panel which doesn’t look nearly as sleek but would allow for greater air-flow, so it’s likely more practical in that sense. The 1000D is the new flagship case from Corsair and it’s expected to cost $500 which is a lot, but for a case of this caliber is surprisingly reasonable. The case measures 693mm long, 697mm deep and 307mm tall giving it a volume of 148 liters. That makes the 1000D roughly 30% larger than the 900D and that was a comically large computer case. The 900D was also incredibly heavy at 18.6kg, but brace yourself because the 1000D has packed on the kilos and is almost 60% heavier at a whopping 28.5kgs. Forget about your back, what’s the structural integrity of your desk like? The reason for the massive increase in weight is largely due to the inclusion of tempered glass panels as Corsair has wrapped not just the sides but also the front of the case in glass, ohh and there’s a neat little strip on top as well. The 1000D follows the styling of the 500D, which is a good thing as I really liked that case, it's got a bit more character than the Obsidian models that came before it. So like the 500D you get those fantastic hinged doors, they’re just twice as big now but thankfully still removable. They’re also held in place by magnets which go a good job and you don’t have to worry about them opening when you move the case because you’re 100% going to remove the doors before attempting to lift this beast. Things that are awesome and work well include the removable dust filters in the top, front and bottom PSU location. These massive panels side out with ease and merely require you to open the hinged door to access them. The I/O panel is fantastic and there’s enough USB ports here for two systems so you can configure those how you like, some can be attached to the Mini-ITX rig and others to the full size ATX system. There’s also a pair of USB Type-C ports. For those wondering only the power and reset buttons for the main ATX rig are found on the front I/O, around the back you’ll find the power and reset buttons for the ITX system. One of the coolest features are the fan trays. With the 500D these were removable so you could install fans and radiators outside of the case and them slot them all in at once on the tray. The 1000D takes this concept to the next level with sliding rails, for much easier access the trays unlock via a single thumbscrew and side right out of the case. 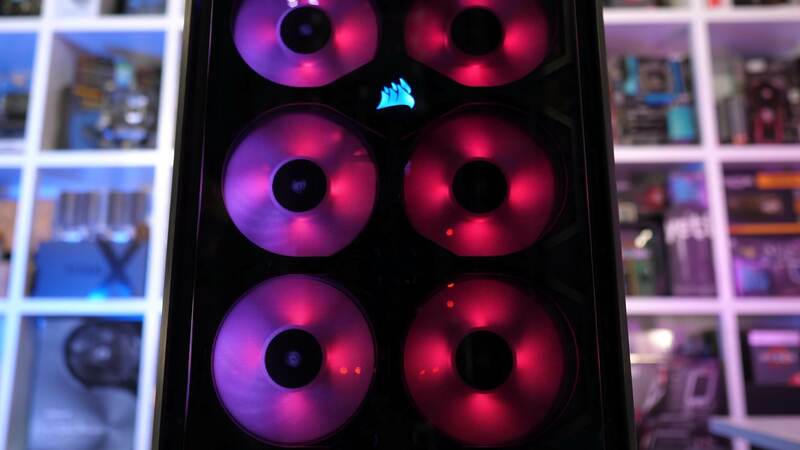 In total you can install 13 fans, eight 120mm fans in the front, three 140mm fans in the top and two 120mm fans in the rear. Corsair says the rear supports two 120mm or 140mm fans in the rear but I wasn’t able to fit two ML140 fans, so not sure what’s going on there. After closer inspection there’s just 260mm of total height here so I’m not sure how you’re meant to squeeze 280mm worth of fans there. Around the back the 1000D takes cable management to the next level with a pair of barn doors. Open them up and you have a massive basement section with a pre-installed Commander Pro, half a dozen 2.5” drive trays, five 3.5” drive trays and a whole lot of space for hitting cable mess. The basement section is 490mm wide, 490mm tall and 70mm deep. 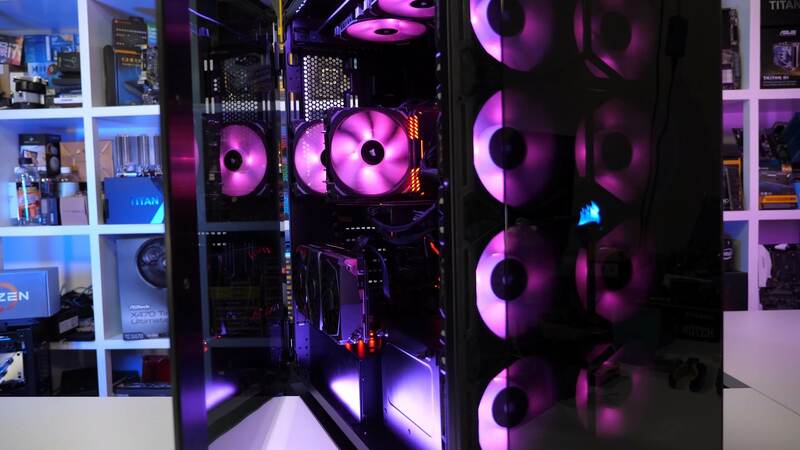 Opening up the left side door reveals a massive interior ready to take advantage of an open loop liquid cooling system, a few of them in fact. With just fans installed there’s 580mm’s worth of clearance for graphics cards, so fair to say you could install a super thick radiator in a push/pull configuration without an issue. Finally the PSU shroud does limit the power supply length to around 220mm as you still need to squeeze the cables in. For such a massive case this does seem a little limiting, that said you will be able to cram something like the Corsair AX1500i in without much trouble. Installing the ATX PSU is a bit of a pain as you need to remove the shroud and this means disassembling the ITX system if it’s already installed. There’s no other way to get the PSU our or adjust the cables, at least as far as I can determine without the manual. A removable bracket at the rear of the case would have really helped with this issue. The same is also true for the SFX power supply but because that’s located in the basement section you can access that directly. So the 1000D isn’t perfect, but it’s pretty close and I don’t see any deal breakers for those wanting to build the most outrageous of liquid cooled builds. I do plan to liquid cool my 1000D and that will happen in a future rebuild of the system. For now I’ve installed the foundations which include the MSI X399 Gaming Pro Carbon and Threadripper 1950X along with a Vega 64 graphics card. Then for the ITX gaming build we have the MSI Z370I Gaming Pro Carbon AC, Core i7-8700K and GeForce GTX 1080 Ti Gaming X Trio. Impressively the 1000D actually manages to make the Gaming X Trio look small. This isn’t the kind of case you’d even consider if your budget doesn’t have a 5 digit number attached to it. Yes it’s massive, yes it’s over the top, and yes that’s the point. 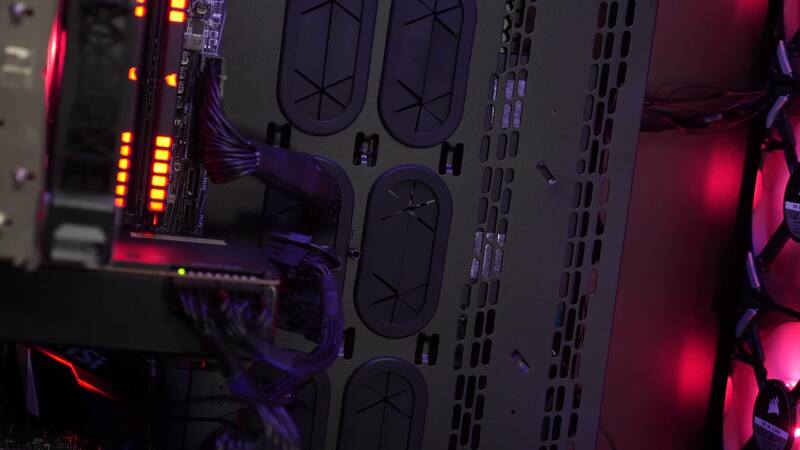 Of course, it’s more practical to build separate gaming and workstation PCs, two systems in a single case doesn’t really make sense, but that doesn’t mean it’s not awesome, because it very much is. 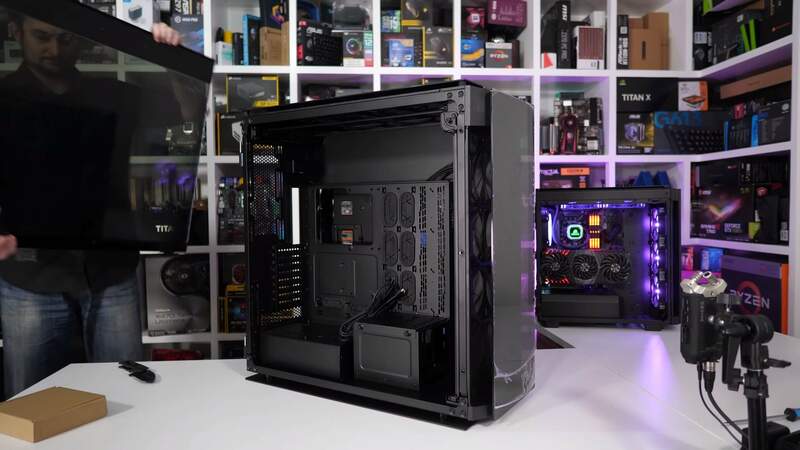 The Corsair 1000D is an impressive super tower, for more details do check out the video above. I can only imagine the reactions I'd get if it was inside this one instead! Here we go again. Ok nice case and all that. But how many do you think they intend to sell? At $500? These kind of articles really do nothing for me. But maybe I'm just too cheap, you know with a family, a mortgage, and so forth. I would like to see more articles about cases that are really affordable to me. I don't expect much in under $75 cases. But would love to see more room, sturdy aluminum or light steel cases with room for hdd's and ssds and yes, optical drives up front. Yes many of us actually do still use optical drives despite the rumors being thrown around by blog writers! Surprisingly if you writers would spend more time on forums you would see people actually still use older and less expensive cases with peripherals you folks claim we don't use anymore! There are people like myself who troll eBay, garage sales and flea markets looking for that tarnished old nugget of a case that would look great with a fresh paint job and a little modding to fit what we want to put inside. I know, there are a few issues I'm covering here, used vs. new vs modding vs. budget limitation. But then that's my point. I would rather see cases covered from that perspective also, and more often to be honest. 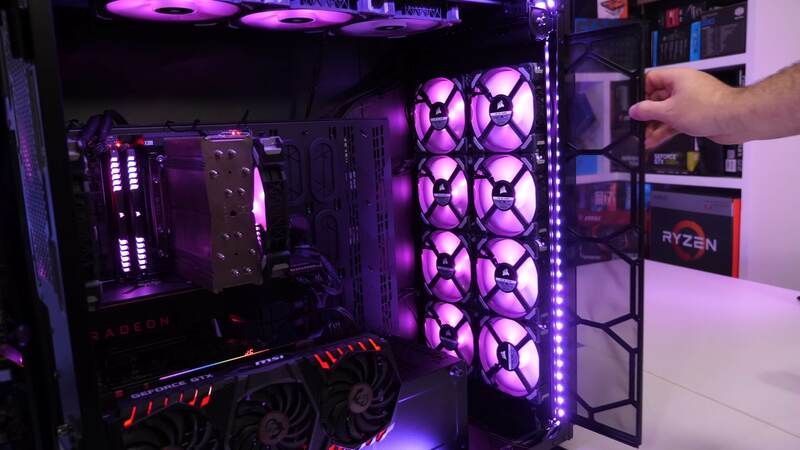 The $500 case.......it's okay, but not a realistic thing for me to even consider, and all that glass is nice, but I want slots and room for my AIO and 2 hard drives minimum and my CD/RW and temp monitor I can see right up front! Steve, davislane1 and stewi0001 like this. They will sell a lot at $500 US. There is a huge market for premium products and a $500 US case isn't exactly a super car or a yacht. I see your points. Window shopping is fun. That's all some of us can do. I like finding used older steel cases and modding them to my needs. Just finished a old Smilodon case and modded it to fit an AIO 240 cooler rad on the flip-down side door next to the mobo. Got rid of the Smilodon markings up front with some royal blue stripes and replaced the side see-through window with a self cut plexi glass window which I painted around the same blue and I'm planing on sketching a Punisher skull on it. I also removed the inside lower racks and fitted a small panel for a side mounted HDD on one side and an SSD on the other. The AIO fans keep it nice and cool exausting out the side panel and sucking in air from the front and back 140 fans. Still not a fan of the all glass because I still use an optical drive and a digital thermometer and usb box on front top slots. Fits my needs. True, its not a car, so Im sure there will be takers. Still would like to see a section on modding older cases though! We don't mod new cases so it's unlikely we'll start used PC case modding content. Really? Care to share the punchline? No, you misunderstood. Not new cases. I meant find an oldie but goody case and have it modded for today. You know like a refresh? There are plenty of You-Tubers who would love that and even some that actually do it with great results. Or don't do it, But I'm betting you CAN find a contributor that would like the idea even within your own staff.